The online store "Really Good Stuff" has a passport to track student problem solving and challenges on 100th day. I have created something similar. We are a bucket filling school and so beginning in January and continuing on past 100 day we also work on filling 100 buckets (random acts of kindness for others, see 'Bucket Fillers Website'). It is simple to omit those pages if that doesn't fit with your 100th day plans. Mon propre passeport pour les élèves de la première année. 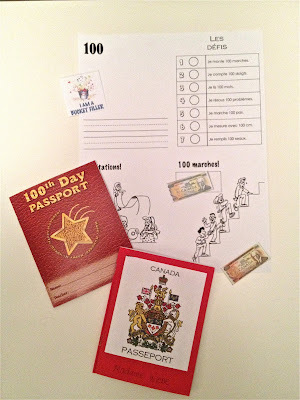 Students get "paid" $100 dollars for every challenge they complete (little photocopied bills to glue into their passport). The student determines which challenges they will complete and when. The reading portion can be used for 2nd term assessment. A list of 100 French sight words is introduced at the beginning of January. It isn't a list to take home and study, it is a collection of common terms, sight words, familiar vocabulary and environmental print that most of the students will know. They are words students have seen so far this year and especially those with sound blends that correspond to what we have studied (on, oi, ou, in). Students may add their own words, if they read a French story at home or school that counts toward their 100 words (differentiate and allow students to showcase their learning). Students work through the passport at their own pace, they can work with a partner, alone or with an older or younger learning buddy. Parents get involved in the bucket-filling aspect of the project, it extends beyond the walls of the classroom and continues beyond 100th day. Students count and group to 100 several different ways throughout the day in concrete and tangible ways. Students can't quite believe that they can complete 100 math problems and are impressed with their success (simple equations). The problems are based on concepts we have already seen, one more, one less, the doubles. We use number lines, a 100 board or manipulatives. We discuss strategies, which are easy, which can I do in my head? It's fun, active, takes place all over the school and requires little teacher work but requires students to get down to the business of counting.